The perfect gift for that student or mom who loves their phone as much as their fashion. 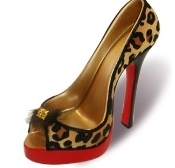 Decoratively place your iPhone or other handheld device in a high heel shoe on your desk! High heeled cell phone stand for your desk, great for moms and students. The perfect gift for that student or mom who loves their phone as much as their fashion. 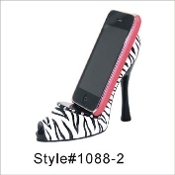 Decoratively place your iPhone or other handheld device in a high heel shoe on your desk! Cheetah Teen Collection Cell Phone Holder Are you constantly on watch for a certain email? 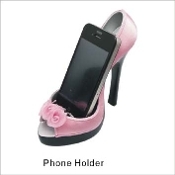 keep your phone on display with this fashionable high heel cell phone holder. Holds any regular size Iphone or Android. May not fit 'phablet' sized cell phones. Display your phone in a way so you can read your incoming text messages with ease. The perfect present for and lady in your life. 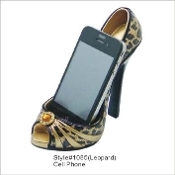 High Heel Cell Phone Stands This glamorous high-heel shoe is a hightech mobile phone holder. Sized to stow most any handset. A style 'musthave' for home or office. Ideal for desk, counter or nightstand. Made of poly-resin. Size: 5.8" x 2.6" x 4.5"
Set your tablet or iPad up on your desk in style. Fits perfectly into this fashionably designed high heeled shoe. Made of high quality polystone. 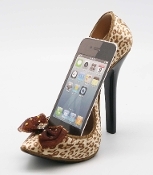 Generate up to 15db of more sound using this high heel phone holder.